The article below is of a longer analysis we will be producing on the state of black America and the fight for black liberation today. The black working class and poor have historically waged intense social struggles and built grassroots movements against institutional racism, economic exploitation, political disenfranchisement, and social alienation. Through fighting for economic, political and racial justice, they sought to be fully recognized as human beings with the right to live a dignified life. Today, the black working class and poor face a deep crisis. Yes, the “whites only” signs of segregation and alienation do not occupy public facilities; ten years ago the U.S. populace voted for and elected the first black president; and there are more highly successful and visible black people in places of power and influence than ever before in the institutions of U.S. capitalism. However, the vast majority of the Black working class, poor, and youth face a different reality under the crisis-ridden, racist capitalist system. The killing of 18-year-old Michael Brown Jr. on August 9, 2014 by white law enforcement officer Darren Wilson set the small suburban town of Ferguson, Missouri ablaze with mass rage against an all-white political establishment, militarized law enforcement, and an indifferent racist court system that has preyed upon Ferguson’s black working class, poor, and youth for decades. The social explosion and activism around Brown’s death put Barack Obama and the ruling elite on the defensive as the Madison Avenue marketing mantra of “post-racial” America was thrown into the waste bin of history. Nine months later, an hour’s drive from the White House, the death of Freddie Gray while in law enforcement custody led to a social upheaval reminiscent of the 1960s, 70s, as well as the 1992 Los Angeles uprising. 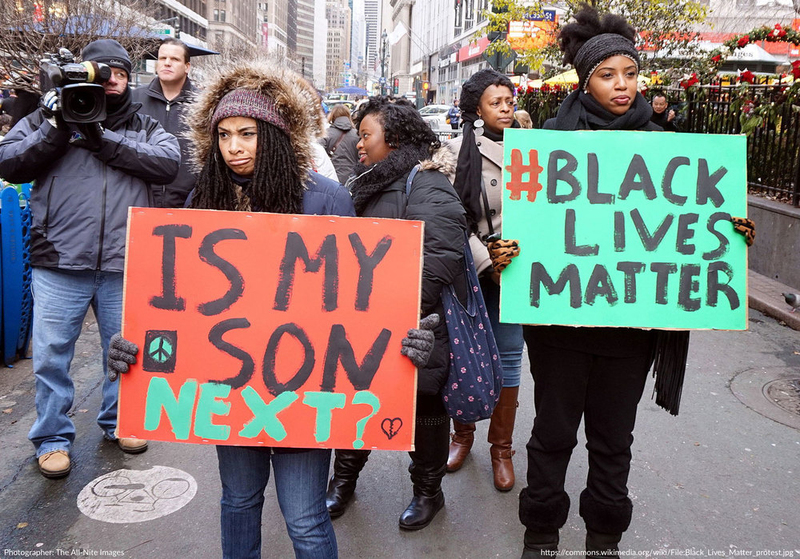 What followed was the crystallization of Black Lives Matter (BLM) – a new social expression against law enforcement violence in communities of color and a rejection of the traditional black political leaders like Al Sharpton and Jesse Jackson. The existence of BLM and mass protest in the U.S. and globally led to a number of limited reforms being passed, like body cameras on law enforcement officers, demilitarized law enforcement, and scathing reports from the federal government on various law enforcement departments. This in turn led to federal oversight of those departments with the worst record of racism and endemic violence in communities of color. It was the power of organizing and protest that led to the rare conviction of Jason Van Dyke, the Chicago law enforcement officer who killed 17-year-old Laquan McDonald in October 2014 with 16 shots. The cover-up of Laquan’s killing was a conspiracy that went to the very top of Chicago’s political establishment. The Jason Van Dyke conviction was a shining victory for the movement. However, the recent sentencing decision to give Van Dyke a mere two to six years for second-degree murder, avoiding possible harsher sentencing of over 20 years for aggravated battery charges, coupled with the recent acquittal of three other cops involved in the cover-up, underlines the criminality of the system and how black lives don’t matter under capitalism. The Obama administration and ruling elite were unable and unwilling to address the root causes of the revolts in Ferguson and Baltimore, or the countless law enforcement killings around the nation. Neoliberal capitalism has meant the decimation of decent jobs, affordable health care, education, and housing, as social inequality grows ever worse. This hits the black working class and poor hardest. On top of that, the two years of Donald Trump’s presidency has emboldened hard-right white nationalists to come out into the open in the U.S. The Urban League recently published a major study on The State of Black America. As one summary explains, “To put a number on it, African-Americans are at 72.5 percent – less than three-fourths – when it comes to achieving equality with white Americans, according to the study, which addressed economics, health, education, civic engagement and social justice” (U.S. News And World Report, May 4, 2018). The lack of wealth in the black community is a generational question that encompasses the effects of institutional racism over many decades and the more recent devastation of the economic crisis of 2007-08 that wiped away an estimated 71 to 92 billion dollars from black households. Black unemployment stands at a record low under 6%, but this does not reflect those that have given up looking for work. Trump has attempted to take credit for this, but black unemployment still remains higher than white unemployment figures and the bulk of the new jobs have been low-paid. The first two years of Trump’s presidency were defined by national budget proposals that would underfund critical social and public services like Housing and Urban Development and Food Stamps that the working class and poor, particularly the black working class and poor, benefit from. This takes place at a time where income inequality and poverty are on the rise and wealth is concentrated in so few hands. Trump’s thirty-day partial government shutdown has had unconscionable consequences for 800,000 federal workers. For black federal workers who make up 18% of the federal workforce it is a loss of both pay and economic sustainability. U.S. capitalism has the diabolical honor of being the nation which warehouses the most human beings in prisons – 2.1 million in all. This is more than in China at the present time. In the recent period BLM, prisoners’ rights activists, striking prisoners, and their families have fought back against mass incarceration and its effects on communities of color. The struggle against the prison system began a discussion and debate among the political establishment and both political parties of big business about the costs and effects of the prison system on states’ budgets, as well as its overall purpose. Mass incarceration has been an essential weapon in the toolbox of U.S. capitalism since the end of the global economic crisis of the mid-1970s. It is a form of social control, warehousing, and storage of surplus labor that was idle in society. Its origin and that of the “war on drugs” also lie in the perceived revolutionary threat of black working-class youth during the height of the black freedom movement. It grew rapidly during the Clinton administration which pursued a relentless neoliberal agenda. The First Step Act signed by Trump in late December was a meaningful but limited reform for those that have organized for prison reform for years. As scholar Dan Berger points out, “The act makes it easier for some federal prisoners to seek early release, widens federal judicial discretion in some low-level sentencing issues and limits some mandatory minimum sentences in federal cases” (Truthout, 1/2/19). The effect on mass incarceration overall will be limited as it only affects federal prisoners who account for 10% of the prison population. 90% are in state or local prisons. The total prison population has gone down from 2.3 million to 2.1 million, a modest decrease that began in 2008. The First Step Act is an important step forward in strengthening the opposition to mass incarceration, but we must oppose dubious attempts to redesign the prison system, like e-incarceration usage of high-tech surveillance methods and house arrest. Instead we must build a mass, multi-racial, working-class movement that fights for prisoners’ rights and radical reforms to law enforcement and the prison system. We must defend the recent referendum which restored voting rights to 1.5 million ex-prisoners in Florida which the right-wing Republican Governor, Ron DeSantis, and Republican state lawmakers are seeking to undermine. We must also demand no jail time for non-violent offenses, the repealing of all state level three-strike rules and minimum sentencing laws, and the release of all elderly prisoners who no longer pose a threat to the community. The movement against mass incarceration must also continue to demand access to jobs, education, and housing for ex-prisoners that would greatly assist in lowering the recidivism rate among ex-prisoners, building an alternative to crime and prisons. The struggle for democratic and voting rights of the descendants of enslaved Africans has been, and remains, a constant struggle for the black working class and poor. The Voting Rights Act of 1965 was a major victory. But this gain has been under relentless attack, especially from the right. From the constitutional crisis of the 2000 presidential election to the 2018 midterm elections and the scandals surrounding the gubernatorial races in Georgia and Florida, it is clear how the black franchise is being targeted. The seeds of the current escalation of voter suppression are rooted in the gutting of the Voting Rights Act. In 2013 the Supreme Court struck down clause 4 of the act, which required states with a known history of racism and voter suppression to receive permission from the federal courts before changing their voting laws. The decision by the Supreme Court reinforced various forms of voter suppression, including voter purging, voter-ID laws, and changing polling locations, already well underway in a number of states by the Republicans. The Democrats have done little to oppose this, despite rhetorically speaking for voting rights. On top of this, gerrymandering has been used to reduce the impact of the black vote and the urban vote generally. Since the passage the of the Voting Rights Act, there have been thousands of black elected officials on a city, state, and national level. The newly-inaugurated 116th Congress has a record number of women and people of color. Some of the newly-elected representatives articulate a progressive agenda which reflects the shift to the left among young people of color but they will now be put to the test. Will they stand up to the leadership of the corporate Democratic Party or capitulate to it like most black politicians did in the past? Georgia gubernatorial candidate Stacy Abrams and Florida gubernatorial candidate Andrew Gillum both stood out for advocating progressive policies that were different from the Democratic political establishment leadership, particularly Gillum. However, as the general election neared, Gillum began to tone down his program points, like calling for a $15 minimum wage and Medicare for All. Both their races were too close to call on election night and the Georgia election was particularly affected by voter suppression. As the recounts began they came under mounting pressure from the Democratic Party leadership to wind things down and accept defeat because of the damage that a prolonged fight could cause to the legitimacy of the system. Gillum conceded to the right-wing, Trump-supporting Republican nominee Ron DeSantis, and Abrams to Republican Brian Kemp. Kemp was Georgia’s secretary of state, who in 2017 purged 100,000 voters from the rolls because they did not vote in the previous election. Stacy Abrams filed a federal lawsuit against the state of Georgia’s election officials, seeking reforms to Georgia’s election system. While Abrams deserves credit for holding out and pushing back, defeating voter suppression and other attacks on democratic rights is going to require a much more sustained struggle. In order to defend the black vote, it is vital to build a consistent mass movement rooted in grassroots organizing and protest that organizes on a daily basis in between election cycles. If a new political party of the working class and poor is to be born, it will have to highlight the defense of voting rights as part of challenging the corporate parties. After BLM Which Way Forward? The election victory of Donald Trump opened up a new political paradigm of an open racist, sexist, xenophobic, and authoritarian presidency. The various leading voices of BLM, despite their criticisms of Hillary Clinton, would have understandably seen a Clinton victory as a more favorable chance to expand on the limited law enforcement reforms passed in 24 states following the events of Ferguson and Baltimore. Instead, Trump’s White House not only has emboldened the forces of hate and reaction, but his first attorney general Jeff Sessions clearly aimed to criminalize BLM and dissent generally, as well as unleashing ICE in immigrant communities. But more broadly, the black population felt the victory of Trump in a visceral way as a major setback. Black Lives Matter still remains a life-affirming rallying cry to those seeking racial justice. However, as an organized force providing radical leadership, a bold program, and organizational cohesion in this period of crisis, BLM is unfortunately absent. However, even before Trump’s ascendancy, BLM was unable to sink deep roots in the black working class and this led the movement to an impasse as there was no clear way forward. Trump’s victory in 2016 was a serious setback, but the situation is beginning to change. The fact that jobs, though badly paid, are still plentiful is helping to give workers, like the McDonald’s workers who went on strike against sexual harassment last year, confidence to fight. Also the defeat of the Republicans in the midterms, while it does not immediately solve any of the problems facing working people, is giving them confidence to stand up and fight back, as can be seen in the Los Angeles teachers’ strike. In the last 50 years since the end of the radical civil rights movement and the black power era, black politics has been dominated by insider negotiation, incremental payoffs, and corporate power under racism and capitalism. Today, we have witnessed the re-emergence of radical and socialist ideas in an embryonic stage of development. The concepts of social struggle, organizing, and solidarity are being reforged in the hellfire of capitalism’s unquenchable thirst for profits, power, and prestige. For the black working class, poor, and youth there is a rich history of struggle, movement building, and socialist ideas in the U.S. and internationally that this generation can learn valuable lessons from as we struggle to eradicate institutional racism and capitalism, which depend on and feed each other.